Time is Running Out! We Need Your Signature by July 1! Imagine 10 more years of rigge d Republican districts that virtually guarantees Republican one-party rule in Ohio for the next decade. Let that sink in. That's what the currently redrawn district map virtually guarantees --- one-party Republican rule in Ohio through 2020. 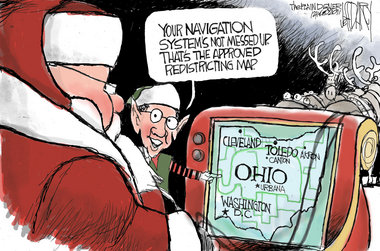 It's as simple as this: unless this redistricting petition gets enough signatures to get on the November ballot, Ohio Republicans will have the upper hand at the state and federal levels. The only recourse to challenge their misguided legislation will be an endless 10 more years of petitions, ballot issues and fund raising for long-shot Democratic candidates. Republicans believe the current gerrymandered districts will save their party "millions" --- and it will. That's because 12 of new 16 districts strongly favor Republicans, and our Democratic candidates will be at an enormous financial disadvantage. But here's the good news. The Constitutional Amendment promoted by this petition would end the unfair districts NEXT YEAR --- in 2013! We only have until July 1st to get 386,000 valid signatures, and we are a long way away. We're way behind and desperately need your help. Located in the heart of the neighborhood on N. High St. between Orchard Lane and West Dunedin Road. Monday thru Friday from 9:00 a.m. - 7:00 p.m.
Sign the petition so that you can be one of the 386,000 valid signatures needed to put this amendment on the ballot!